Annie is our companion, bird dog, and breeding female. She received her APLA Certified Pointer title in South Dakota in the spring of 2014. 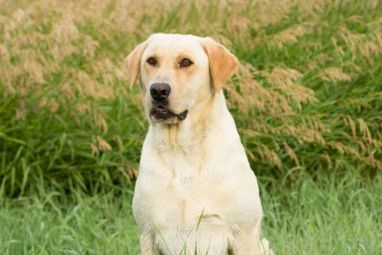 Annie's parents are both 4X Grand Master Pointers and Annie is a hunting and retrieving machine on land and in water. Click on the link to see more pictures and read more. Charlie is another family companion, bird dog, and breeding female. She earned her APLA Certified Pointer title in September 2016. Charlie has a very unique pedigree and is a beautiful chocolate pointing retriever. Charlie will available for breeding in the spring of 2017. Click on the link for more info on Charlie. Maddie is my daughter Carly's female and was born 01/15/2015. She is very muscular, has a nice broad chest, and is extremely athletic and quick. She is the hardest charging retriever you will find and has a high output motor! She has all the looks and bird drive to please any hunter or test runner. Carly plans to breed Maddie in the spring of 2017. Click on link for more info on Maddie.